Love In The Time Of Cholera is a book that I would not have normally gone for. Although I read Pride and Prejudice, I didn’t see this one as one that would interest me, but the person who suggested it knew I would like it, and like it I did. I think love it is a more optimum choice of words. I was just over half way through the book when I realised that there was only a little speech in the book, but it is told in such a way that you do not notice. You are watching the lives of several people pan out in front of you. It is a story of unrequited love in the extreme, and Márquez knows how to shock. At several times during the book I was stunned and sitting there open-mouthed. At other times I was laughing so hard tears were running down my cheeks. He manages to use a word so many times in a paragraph and it works, even using it side by side. The love that one of the characters holds for another and is willing to wait for all of his life if necessary for the love of another. The book is about love, loss, depression, envy, and once again – love. Fermina Daza, Dr Juvenal Urbino and Florentino Ariza make for three very good characters, very well created and believable. I found it interesting that Márquez uses some people, places and encounters that actually happened in history. I looked up some of them and they were described as the author also created them in the books. I didn’t want the book to end as I felt the characters had become friends, living through more than fifty years with them, through their ups, their downs, their tears and their joys. It will not be everybody’s cup of tea, but I would recommend you try it. You never know, you may like it as I did. 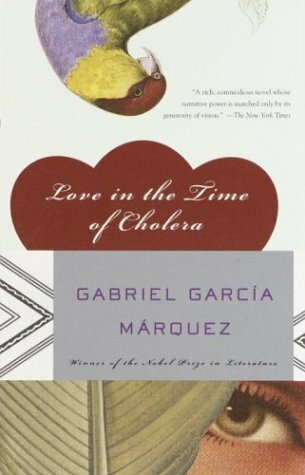 This entry was posted in Fiction and tagged Books, Cholera, Fiction, Gabriel García Márquez, Historical Fiction, June, Love, Love In The Time Of Cholera, Romance. Bookmark the permalink. I did. I am finding it difficult to tear my mind away from it enough to move on to another book. I was so anxious to get started on this book that I checked to see if I could download it to my Kindle but I couldn’t. 😦 Will have to wait until I find a bookstore on the road. I looked quickly on Amazon and didn’t see it as a Kindle download. I will look again. Thanks! I just had a look and for some reason it is not on Kindle over there. How weird is that? Very weird. 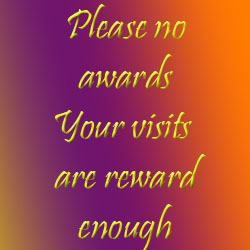 Oh well, I will be visiting my SIL soon so I will get to a bookstore. I am going for a horror next. Just for a change. It has been years since I have. I think it was a James Herbert or Shaun Hutson. hmm, maybe I’ll read it too. 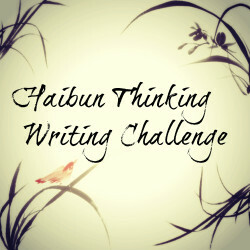 If you read it before I do, will let me know what you think of it? One of the finest novels I have ever read. The man is a genius, and taking us on THAT particular love story is just so unique and touching, and I agree, I didn’t want to let it end. Wanted the characters to keep on going. This guy does what writing should be. It is definitely one I shall remember for many a year. Like most good books, there was a disturbing part to it, but even that can’t take away the genius of the writing. Between this guy and Rushdie, I strive to write in something approaching their sphere. May never make it. But damn will I ever try. It was all bunk. That is a gorgeous bunk and there is not one bit of harm in it. Try The Moor’s Last Sigh by Rushdie. There is no living writer as great as this guy. He is challenging, inventive, completely unconventional, and will be remembered forever for this writing. I will look in to that 🙂 I may have it on a USB of thousands of books I have. 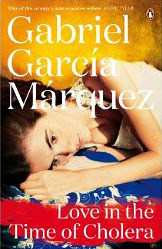 Garcia Marquez is one of my favorite Latin writers and Love In The Time Of Cholera is an excelent example of his work. Great review! Thank you Yvo. I am going to read some other books before I pick up another of his. I love the way he brings the characters to life. I started reading it as soon as I finished it, but the ending was too fresh in my mind. There are some books I have read several times, and this will be another.